Martin Paul: I *like* Helping Hands. Lily Duveen: [primly] And I don't like "helping yourself" hands. 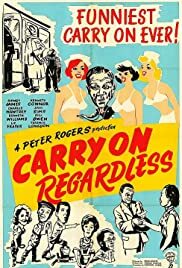 For their fifth venture, the usual "Carry On" suspects (Sidney James, Kenneth Connor, Charles Hawtrey. Kenneth Williams, Joan Sims and Hattie Jacques) are joined by other irregular members (Fenella Fielding, Liz Fraser, Esma Cannon, Terence Longdon, Bill Owen, David Lodge and Norman Rossington) and some surprising cameos (Stanley Unwin, Jerry Desmonde, Kynaston Reeves, Howard Marion Crawford and Patrick Cargill) in a frequently hilarious but ultimately patchy and disjointed romp. James' Bert Handy heads "Helping Hands", a well-meaning but hopelessly incompetent firm providing any services the customer may require: and, so it is that James is asked by an eccentric millionaire to take his place in the queue at a hospital's waiting room and is consequently mistaken for him and waited on by the matron (Jacques, naturally); Connor is in top form here: ostensibly hired as a babysitter, he finds himself acting as Fielding's lover to arouse her neglectful husband, being a librarian driven to hysterics when attempting to observe a public library's rule of silence, getting himself all wet when, completely misunderstanding a client's request, he engages in some Hitchcockian espionage aboard a train full of sinister passengers, getting engulfed by the "Bed of the Century" when attending an Ideal Home exhibition and, best of all perhaps, going "cold turkey" after his sixth attempt to stop smoking; Sims also has a memorable bit when she ends up drunk at a wine-tasting event and makes a shambles of the place to the chagrin of organizer Crawford; Hawtrey goes into the ring against a massive opponent when, acting as his second, he inadvertently injures the challenger! ; Williams enjoys a tea party with a group of chimps at the zoo, etc. before multi-linguist Williams manages to explain that he is their landlord and is about to throw them out! As one can make out, there are several funny bits in this film but it is also evident that its inherently episodic structure (which entails that some of the gang members are given precedence over others) fails to coalesce into a cohesive and completely satisfying whole.